$150 Earn a $150 statement credit after you spend $1,000 or more in purchases with your new Card within the first 3 months of Card Membership. 1.5% Unlimited 1.5% Cash Back on your purchases. 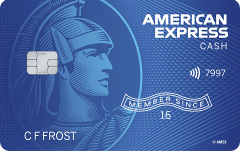 Our take: The 1.5 rewards rate on the American Express Cash Magnet card is nothing special, but the introductory offer is a nice bit of extra pocket change.